What differentiates a wilderness knife like this one from a traditional hunting knife is the length and thickness of the blade. This one is 5.2 inches long, while the entire knife measures 9.75 inches. The blade has a drop point and features VG-10 steel, a high-end material that supplies hardness and edge retention. The blade is a bit thicker than a hunting knife, in order to give it a bit more strength and heft for chopping and hacking. The handle is non-slip black Thermorun. 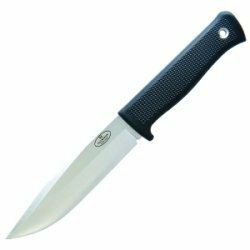 If you're looking strictly for a hunting knife, you may find the Fallkniven H1 Hunting Knife to be a better choice. Though the S1 does so well, it would likely be a great choice too.